For a few small reasons, I haven't been riding much in the last few weeks. 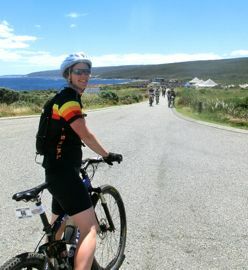 However this time last year though I was in the homestretch of training for the Cape to Cape MTB race. 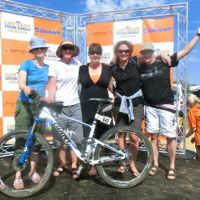 It all seems like a lifetime ago and when i think of it I wonder how I managed to finish the race at all! Anyway I came across these photos tonight and felt like reminiscing! At the moment I'm training for the 4km paddle in the Tullah Challenge - but it's a very short training program as it's on this weekend so after this Saturday I'm going to be at a bit of a loss as to what my next goal is.. we all agreed that while the Cape to Cape was great to have done, we're not going to do it again - it's a long way away and quite expensive - and also now I know exactly how tough it is ait would be very hard to psych myself into facing it all again! So I've been surfing the WWWs to see what's available - I have all this bike fitness (relatively speaking) that it would be a shame to waste. So here are some options..
Dec 1 - 2 Forrest Festival - 5 stages in 2 days. Probably a bit much and a bit soon. Another time. Jan 25th - 28th - Hellfire Cup (Tas) - this event has the scariest name but by far the coolest website! It's a pairs event but you don't have to do everything together - i.e. one of you can do the hill climb stage while the other does the criterium. The longest stage is 45k - so pretty doable with my new experience. It looks pretty cool actually. Jon is doing it so it might be tricky with the kids but there's mention of a kids tent and movies so perhaps it's possible? - would need a willing partner though (ideally one who likes hills!). Also there is a night race. hmm.. too intense? 9 - 10 Feb 2013 - Blue Dragon (Tas - Derby)- Jon will be doing this so it's not really feasible to do it as well. Also it's a bit um.. hilly - it's a good one for my hill climbing buddy Clare but there might be more Cathy-friendly events around! 16 Feb 2013 - Otway Odessy - again it's 100k but with a 50k option. This would be fun but we've been to Forrest twice so it might be time to do other things. 9 - 11th March 2013 - Bike Buller MTB Festival This looks pretty cool - one of the events is a 4.5 hr enduro but get this - it's on the 6km downhill course and you get to catch the chairlift back up each time - COOL! 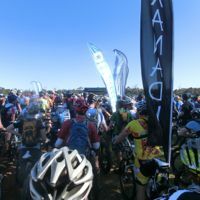 There are officially 3 stages but softer options for each stage - so for example instead of the 50k on day one, you do 30, instead of the 4.5hr enduro you just do 2 runs. 16th March 2013 - Capital Punishment (ACT) Again I'd do the 50k version. It looks good but I have to say the extra hop to get to Canberra could make it a bit expensive. The trails would be good though! 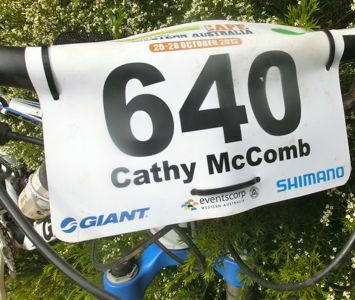 14 April 2013 - Wombat 100 - (VIC) I'd probably not do the 100, but the 50k version instead. 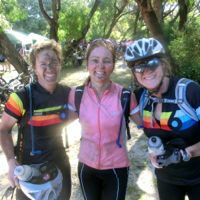 Just a one day race, near Melbourne that looks pretty fun (and family friendly) A Maybe?? 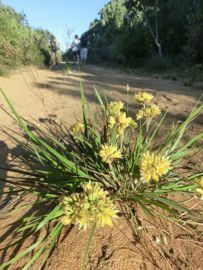 13 - 17th May 2013 - Alice Springs Enduro - 7 stages in 5 days. Apparently the riding is good and the logistics are easy but I have to say it looks too hard-core for me - one stage is 77k - ugg. By far the best part of the Cape to Cape was doing it with my good buddies - I wouldn't want to do any of these without either my family or my friends (ideally both of course). So..Any takers? 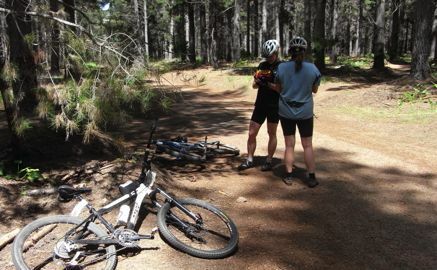 Today we went back to The Pines which was our favourite single trail section of the Cape to Cape. It was great fun - we went over most of the tracks and even did the super fun bits a few times! 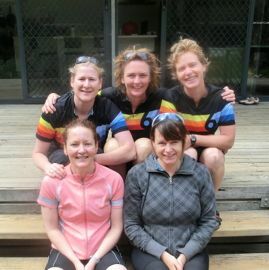 We also stopped heaps for photos. It was so nice to do it without crowds and the painful effects of the previous two and a half days of riding! The forest itself is a pine plantation on a broad spur - with runs loosely linked by fire trails which take you back up the gentle hill. Some of the tracks looked like they were finished just last week. The runs are smooth and twisty with jumps and berms, and names like Whoop-Whoop and Bear Grylls and Noodle Bowl. Certainly worth the trip if you are in that area. 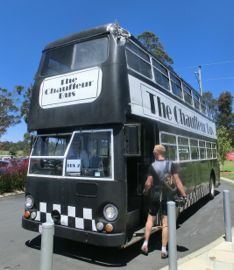 We even got Matt out on a bike as well which was nice.. but it did mean we had to stop for a few fag/fad breaks..
After a cruisy hour or so of riding we found a picnic table and continued the cheese and bread fest that we started when we stocked up at the Margaret River Dairy yesterday. Noice. 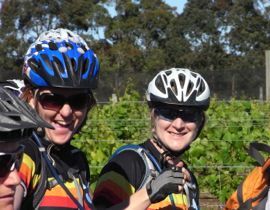 I've been impressed by the ability of cycling friends Su and Jessica to take a photo at the start of a trail run, and have it posted collecting 'likes' before you've even reached the end of the run. So today Jo and I had a race to see who could get something up on Facebook quickest. It was close - Jo had it up before we even picked up our bikes from this point and started cycling. I had mine up about 4 hours later when I finally worked out how to do it on my new windows phone. dang..
We've slowed down the pace a little and after a morning packing up our Hamelin Bay holiday house we've now moved ourselves 90 or so kms north to Matt's parent's holiday house in Busselton. A beachfront house, comfy couches and a washing machine turned out to be just what the doctor ordered. In fact the treatment was so effective I even felt like going for a fun cycle along the bike path in the afternoon. Sweet as. Actually that reminds me of something that made me laugh yesterday .. I'd just reached the last 5k of the race, which turned out to be the most technical of the whole 4 days, and not only that, if you fell you landed on rocks, rather than the soft dirt and sand of most of the other single trail sections. Anyway - when I reached the start of this single trail I had a few people in front of me (well I actually had about 500 people in front of me, but about 3 people directly in front of me, and a few close behind). One by one the people in front crashed out, and I at regular intervals heard braking behind me, and then people yelling 'slowing!.. stopping!' as they were stopped by whoever had stacked in front of them. . until I had no-one directly in front of me and there seemed to be only one guy left behind me. I could tell he was quite close, so I yelled out 'DO YOU WANT TO PASS?' and he said.. 'IMUPPYUZ!' and so I said 'DO YOU WANT TO PASS - YOU CAN DO IT HERE ON THE RIGHT..' and he said again 'I'M HUPPY AZ!' and that was when I realised he was one of the guys from New Zealand. No wonder I couldn't understand him! As it happens I'm glad he didn't pass cos by the time I reached the end of the section he was no-where to be heard so he either stacked or I somehow dropped him. Anyway - here is a photo from the end of the bike track - miraculously my legs easily took me about 26k! I'm also huppy az. So - I dragged my buddies all the way over here on the back of an SBS documentary of this event that I've watched a few times. 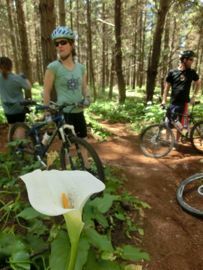 The scenery lived up to expectations, as did the weather and the trails. What the documentary fails to convey however, is how massively tough this is. It's really really hard! It's hot, the days are long, the trails are great but they come with HILLS! Did I mention that it's tough? We all did so well to finish without major mechanical issues (in fact I think the worst thing that happened was my water bottle carrier broke, and Jo lost her lolly snakes overboard today). No flat tyres, no major injuries (although both Clare and Jo are nursing gravel rash), no give-ups, no dummy spits, no broken anything. Just the sweet sweet taste of success! In fact, here we are on the podium as we were all winners of our categories..! 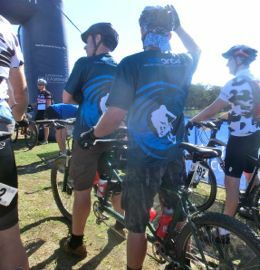 Also we discovered the Cape to Cape is not just hard on the body - despite it looking easy in the event information, it's also really hard to do this event without a support crew. Luckily Jo's lovely boyfriend Matt (who has taken lots of these photos) was able to help after a few days so we weren't at the mercy of the shuttle busses anymore - which is a whole other blog post for a later date! We did it! Today was hot, 27 degrees when we started at around 8.30am. We'd all revealed that we'd slept pretty badly the night before so the 6am wakeup call (for a 6.45 departure) was hard especially with worn out bodies! 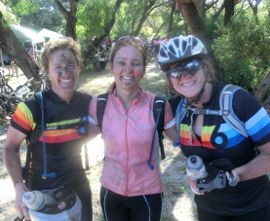 Day 4 was the longest stage - 66k from Margaret River to Dunsborough. It was a fast and relatively flat first 36k, then an arduous (for me anyway) series of rolling hills followed by a rocky and quite technical last 5k which required our tired legs and brains to focus. I was pretty happy with my ride - and completely ecstatic to see the finish! - I wasn't able to keep up with the powering groups of riders who came past me on the open road sections so I was basically going at my own pace the whole way. On reflection I recon I had a pretty good last 5k through the rocky section as one by one people in front and behind me rode into trees, or off bends, or were tripped up on drop-offs so I got to find my own lines and get some groove on. That'll be those technical lessons paying off! Belinda had a really strong ride today and came in in 3.12, Clare did 3.20, I did 3.28, Nic was 3.36 and Jo did 4.34 which was pretty good considering she had a pretty nasty fall with 20k to go. Today was the first afternoon we really got to enjoy the local area so after leaving Colonial Brewery where we finished, we refuelled at a great little cafe in Margaret River, then visited a vineyard (sorry Jonno I blogged while they purchased), then we went to the local beach for a swim. It was beautiful and relaxing and thoroughly deserved! 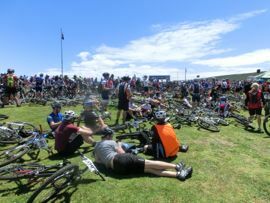 So I've just looked at the race stats on the cape to cape results site and seen that there are 1083 riders (gosh!) - 943 men and 140 women - double gosh! After yesterday I was 533rd overall - I recon that will slide a bit today - but it's still great to discover I'm not the slowest mtb rider of all time - yay! I think I reached my peak by the 40k mark today (out of 56) as after what felt like a reasonably strong ride though miles and miles of beautiful single track I suddenly found myself going backwards through the field - I didn't feel like I had hit the wall or anything, I just felt tired! Anyway - today's stage took me 3.22 minutes. It was hot but not too bad as we started at 8am. Clare and Belinda came in in about 3.10, Nic was probably about 3.34 and Jo had a really strong ride today, knocking off more than an hour from yesterday. 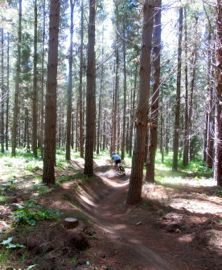 The single trail was great - beautiful corners and although there was a little congestion, it wasn't worth getting worked up about as there were plenty of opportunities to jump past on the linking fire trails. The organisers did a great job with staggered starts today so I felt like I got to use my mtbskills heaps today with the little obstacles and beautiful sweeping berms. yay! 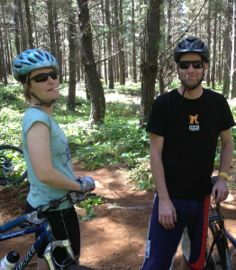 It was pretty much small fire trail and single track for the whole lot. One day to go - 68k! 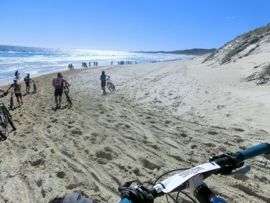 Today's stage started from near our house in Hamelin Bay which was good as it started at 8am! 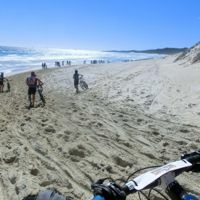 We haven't had a chance to check out the surrounds really but we did get a quick peak at the beach before we started..
Today's stage was further than I've ever ridden a mountain bike - 63k. So it was heaps longer than yesterday (took me 3.41, yesterday was 2.51) but it was way more pleasant with 20ks of single track through lovely forest. Not surprisingly it was bumper to bumper though so difficult to actually get a good run at the bends and obstacles - that's what comes from being in the very very large pack I guess! I looked at my watch when I felt I'd finally got into 'clear air' and it was 90 minutes into the race - I guess it didn't really matter as it there was still a long way to go but it was all so pleasant looking it would be good to do it again sometime when there aren't 900 other cyclists around! 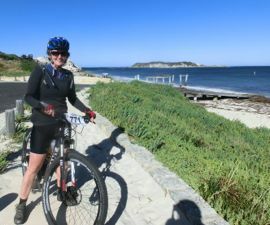 The last 20k was through wineries and it was fantastic riding - fast dirt roads and sometimes we were really just rolling right through the middle of vineyards - you don't get to do that in Tassie. Overall it was long and tough and I was delighted to finally see the finish but I'm satisfied with how I rode today. Yay for hilly long training rides! Tomorrow is 50k or so and a lot of it is technical single trail so I'm expecting large holdups again! Clare and Belinda finished pretty close together about 10 minutes or so quicker than me, Nic was maybe 15 behind, and Jo toughed it out and finished in about 5 and a half hours. Hard going! She was by no means last though. 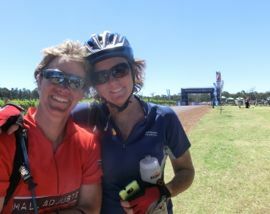 Belinda and Nic at the finish. So the day finally arrived! As you may have observed from the above post I really don't have the energy to really write anything interesting.. so I'll just try to work with photos and captions.. It's not a team event, but above is our pre-start team photo. 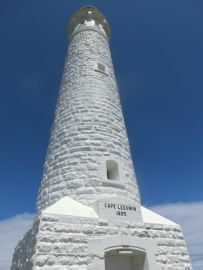 The race starts from Cape Llewyn lighthouse which is just south of Augusta. 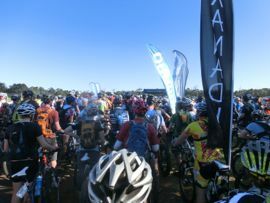 There were so many people at the start, we couldn't hear a thing from the announcer who was blathering on for hours. So we waited around for what felt like forever to start. In the end we started about 12:45 in one big 900 rider group! Today's stage is the shortest at 41k but apparently (and hopefully now we've done it) the toughest as there were a few steep hills and a lot of sand to deal with including this stretch along the beach. The scenery was great actually - I would have taken more photos if I wasn't racing! 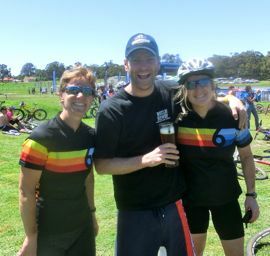 This is me, Clare and Belinda at the finish. As you can imagine we're rather disappointed that the washing machine at our house is broken! We had no major mechanicals amongst us today which was great - everyone got back with smiles although we are all completely buggered. 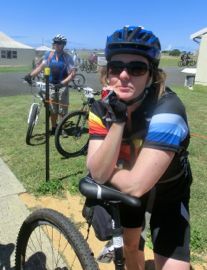 I had a good ride too - it was tough but I enjoyed it. It's impossible to know overall times but I finished in under three hours. Belinda and Clare were super speedy. After the finish today we checked our bikes into the storage place and walked home which took probably half an hour. Not surprisingly the flowers around here are really lovely. 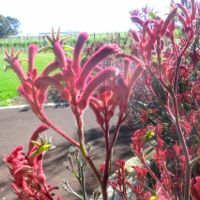 I have to say it's not quite (or even close to) as well organised as what I saw of Tassie's equivalent - Wild side. In fact some aspects are just really crappy (which I'll expand on when I have more energy!). Anyway time to rest up for our early start tomorrow.. Sadly we don't have mobile coverage where we are staying this blog is posted about a 5 minute drive down the road. 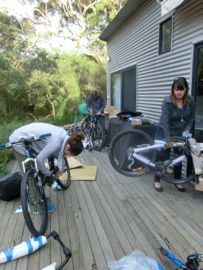 Assembling bikes after a very long day..
Let's not count the cost! ..at least not with a calculator! 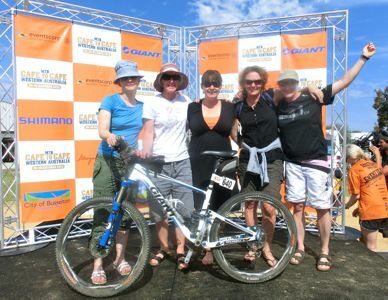 In 2005, shortly after Jett's birth, we went to Canberra for Jon to race with his team in a 24hr mountain bike race. It was a really difficult trip as Jett was only weeks old, and Zali was still well under 2. The kids and I stayed at our friends place in Canberra while Jon camped at the event. 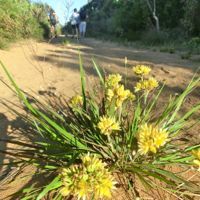 It must have been just months before I started this blog actually as I would certainly have blogged about it if I had had the energy! Anyway - I remember this trip for other reasons as well - firstly for financial reasons - Jon had bought a whole new bike for the event (which was fair enough as his old one was pretty crap), and cos we had both the kids and all the bike and baby stuff we had to buy a roof box for the car, in fact we might have even had to buy the roof-racks and the bike racks as well. The event cost well into the thousands. The other reason I remember the trip is that after all his purchasing and preparation, Jon got a violent gastro and spent the afternoon of the race spewing his guts up. The kids and I made a brief visit out to the event for just long enough to see how miserable Jon was and for him to give his virus to Zali, who spent the rest of the evening spewing in various places (including the car and on Belinda and Jase's relatively new couch). Gosh that was a long weekend, and not as in a long, fun public holiday weekend, but a loooong weekend. + other stuff I've forgotten thankfully..
Actually I'm not even going to add it up. I'm going with a great group of four girl friends from way back (who I never get to see enough anymore) and one new friend who I like as well - and I'm pretty sure that when I take into account the human factors this time, I'm going to come back well into the black!